Kenai Fjords National Park is located in south-central Alaska, near the town of Seaward, about 130 miles south of Anchorage. The beautiful park contains the largest ice field in the United States, Harding Icefield. Nearly 40 glaciers flowing from Harding Icefield have carved the numerous fjords for which the park is named. Most of the park is only accessible by water so boat tours are the best way to see the immense power of the tidewater glaciers up close. These tours also offer the best chance of seeing the park’s marine wildlife including seals, otters, orcas, humpback whales, and many more. The only maintained trails are found in the Exit Glacier area and the 2 best hikes in Kenai Fjords are listed below. Official Website. System of short trails with excellent viewpoints of Exit Glacier along the way. The trail is paved most of the way to the Toe of the Glacier but becomes rocky as it meets the glacier. At its end you can get close enough to touch the glacier. This loop is a great chance to see the impact the glaciers have made on the surrounding landscape. 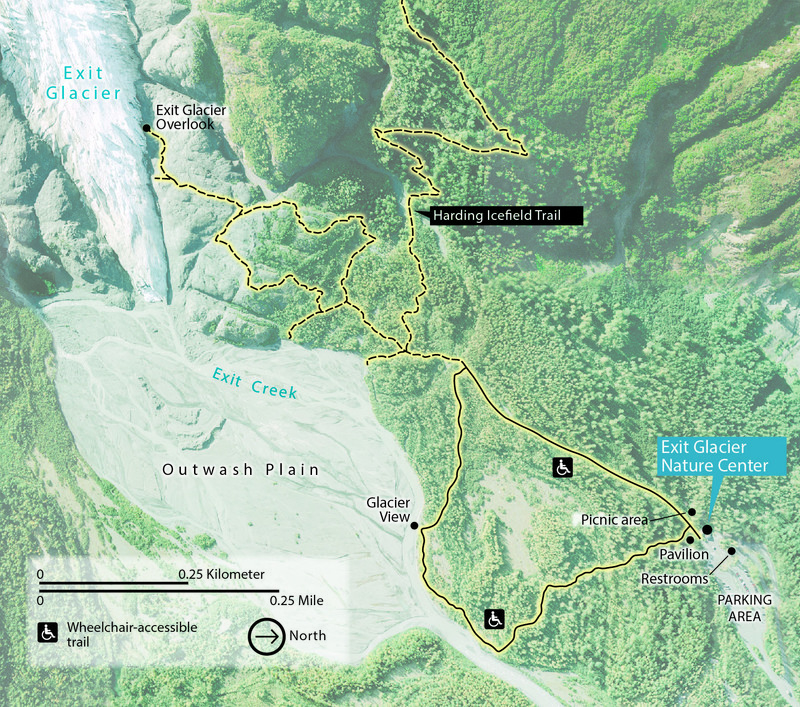 The trailhead is also located next to the Exit Glacier Nature Center.